The constitution is the governing document of the Society and it sets out the agreement between all the members about how the Society is to be run. Among its clauses are rules about what the Trustees may do without prior reference to the members, how Trustees are to be appointed and the formal process for members to put items of business onto the agenda at a general meeting. 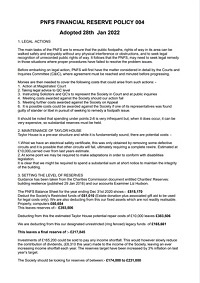 Of course, in practice, it is usual for members to first raise a matter which concerns or interests them through informal contact with one or more of the Trustees. The Society can do only those things which are within the “Objects” (clause 4). A fairly narrow view must be taken of the meaning of the words in that clause and “all objects conducive to the foregoing” is not a licence to do anything not incompatible with the earlier words in 4(1). The objects can only be changed by an EGM and must also have the consent of the Charity Commission and its powers. The Trustees have a number of obligations which mainly reinforce the constitution but, in theory, might in some circumstances be at variance with member wishes. Also the law adds to the powers given to the Trustees by the constitution to facilitate their prudent management of the Society. Policies are documents written and approved by the Trustees which set out in more detail what they can and can not do. These policies must, of course, be entirely consistent with the constitution and are often more restrictive than that document. A member is entitled to expect the trustees to take great care to observe the constitution and the policies. The trustees can answer any questions about them - see Contact Us. 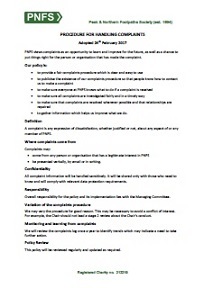 This document sets out the procedure that should be followed if a person wishes to make a complaint against an Officer or member of the Society, or about the running of the Society. This policy was put in place in to satisfy our insurers. 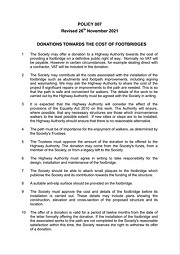 The society has a policy on how it will work to ensure that highway authorities and other relevant bodies fulfil their obligations under the Equality Act 2010. A draft of this policy was included in the July 2015 edition of Signpost (no. 49), and discussed at the Half-Year Meeting in November 2015. A majority of the members at that meeting were in favour of the policy, and the management team formally adopted it as society policy at its meeting on 27 November. The Charity Commission expects every charity to have a policy regarding the level of financial reserve that it holds. This policy was updated in February 2018. Footpath and bridleways which existed before 1949 and are not currently included on the definitive map will be extinguished in 2026. This policy explains how the Society intends to assist in recording as many rights of way as possible and how you as a member can help the process. This policy was adopted in November 2016. The Courts & Inquiries Committee receives and discusses reports from the Courts & Inquiries Officers; authorises the serving of pre-action letters and statutory notices on Highway Authorities; recommends to the Trustees the commencement of court proceedings; and authorises formal objections to various types of orders. This policy was updated in December 2016. The Society is prepared to pay for the cost of new footbridges. This policy explains the circumstances under which we will do that and the conditions attached. This policy was adopted in March 2013.